There have been great advancements in warehouse lighting and technology over the past few decades, which has given facility managers the chance to save money, energy and time. If you are interested in LED lighting, it is best that you learn all about the different advantages that come from using it. Until very recently, many larger buildings, car parks, airports and warehousing facilities were using metal-halide lighting or fluorescent lighting. 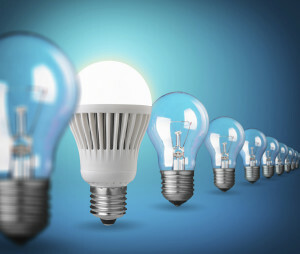 While these are excellent options, modern LED technology gives options in both cost and energy savings. The LED lamp itself is a great place to get started when looking at how you can save money. These lights are between 40 to 60% more efficient than the metal or fluorescent options. A metal-halide lamp that is on the exterior of a building will have an average lifespan of about 20,000 hours. The very same lamp gives 60% lumen maintenance, resulting in a 30% loss of light after just 5,000 hours of use. For three-quarters of the lifespan of your lamp, it is actually putting out the lower quality light. A LED lamp will give you a lifespan of 100,000 hours along with lumen maintenance of 92% and 50,000 hours. You are only going to be getting 8% loss throughout the lifespan of the lamp. What these figures mean is that you are going to get a higher quality of light for a lot longer. LED will also give you advantages when it comes to outdoor lighting, meaning that it will minimise light pollution due to the fact that it can target the surface area of an object, such as car park signage or a doorway. This is important if you have a facility in a residential area. Any traditional lighting options for the outdoors are unable to do this. When you combine the outdoor ability with indoor lighting that can help you to recreate natural daylight, you really have the right environment for your workers as any visitors that come into space. Looking further into saving, automated lighting systems have the ability to simplify your life as a facilities manager. You can oversee the lighting of your space from a simple software program where you can monitor wattage and get alerts when it comes to maintenance needs and controlling the energy distribution. When you look at all of these advantages and the fact that you can save up to 10% more on your energy output, LED lighting is a win-win.